Usable water occurs in underground pockets known as aquifers. Groundwater commonly occurs within earth materials through which water moves poorly, and thus its extraction becomes challenging. Groundwater also may occur very deep in the Earth, making extraction impractical, even if its quality were acceptable for everyday uses. Also, groundwater may contain excessive amounts of salts or minerals, or it may be contaminated. Our experience offers comprehensive exploration drilling services to ensure you receive accurate and precise information. 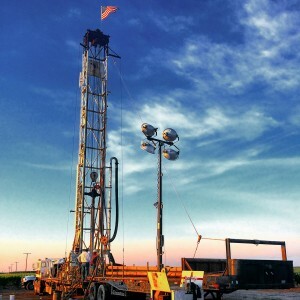 There are a number of methods available for locating groundwater, ranging from straightforward drilling to more elaborate and complicated geophysical techniques. Common methods of exploration include: examination of existing well reports; geologic mapping; aerial photographs; radar; electrical conductivity; magnetism; gravity; and seismic methods. The most commonly used method for determining the location of groundwater is by drilling a test well. Drilling into untried or unknown geologic formations may be the only method for obtaining information where none existed previously. Test wells yield information on geologic formations, where water may be found, the quality of groundwater, and the type of materials and techniques that may be necessary to complete a well in the selected location. The exploration well also can be pump-tested to give data on the quantity of water available, how much is stored in the ground, and how readily that water can be extracted from the well (collectively known as aquifer characteristics).